As you can see, you can choose to create either a collaboration or a process diagram by default. What’s the difference between process and collaboration diagrams? A BPMN process diagram describes just one process meaning a sequence or flow of activities in an organization. A BPMN collaboration diagram shows two or more processes and interactions (message flows) between each process. If you prefer you can also clone an existing project from our BPMN process examples. Select the project you want to clone and click the green button Fork this project. Like always, we are following the OMG specification (Business Process Model and Notation). It means that GenMyModel stores the BPMN models using a standard format. Thereby you can export and import BPMN2 diagrams to BPMN process tool like Eclipse BPMN2 Modeler, Bonitasoft, BPMN Web Modeler or any other one that supports the standard BPMN2 format. How to export my model to BPMN2 format? 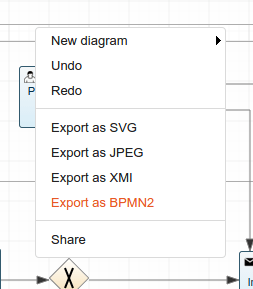 In the BPMN editor, right click the canvas and select export as BPMN or go to the menu tools/export as BPMN2. 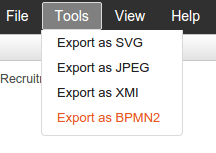 You obtain a XML file which matches the BPMN2 specification of OMG. Of course, shortcuts are available for most of the tools (type ? to show all shortcuts in the editor). BPMN2 diagram import to GenMyModel (under development). Ability to change the type of tasks, events and gateways (e.g change a user task to service task). 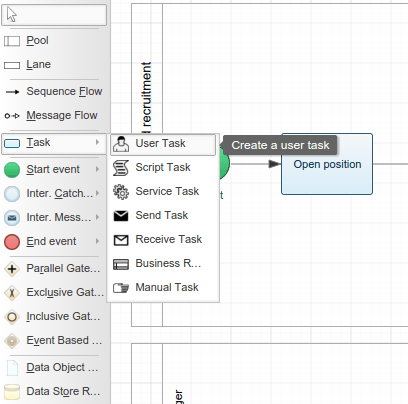 Enable pool creations or process diagrams from an existing process. As usual, we are opened to any ideas that you might have to improve your favorite modelling tool. So don’t hesitate to give us your feedback about this new release in the comments or in our forums.